Your CAT score can make you eligible for admission to 13 IIMs and other affiliate B-schools in the country. Even though CAT entrance has been around for many years now, its validity is limited to Indian MBA programs alone. GMAT, on the other hand, opens up avenues in some of the best management institutes in India and abroad. This includes prestigious international B-schools such as the Harvard Business School, Stanford and Wharton in the US, INSEAD in Singapore and France, and the London Business School, as well as some leading management schools in India such as the Great Lakes Institute of Management in Chennai, Indian School of Business in Hyderabad, and SP Jain Business School in Mumbai. The GMAT score is also recognized by the IIMs. In fact, overseas aspirants aiming for IIMs have to take the GMAT to be eligible for admission, as the CAT is conducted only in a few locations in India. Therefore, GMAT definitely broadens your prospects of making it to some of the most prestigious business schools around the world, provided you can manage ace scores. Admission to B-schools based on your CAT scores is like a long hurdle race, in which the entrance exam is just the first rung of selection or elimination. This is followed by intensive rounds of essay submissions, group discussions and personal interviews, each with a higher difficulty level and elimination rate. More so, these rounds come with rather arbitrary ‘cut off’ standards, so there is no way for an aspirant to know their odds of making it to the next level. In addition to these, Class 10, Class 12 and graduation marks are taken into consideration for admission. In the case of GMAT, the process of admission is a lot more streamlined. Having attained a good GMAT score, you can apply to various colleges around the globe with an essay/statement of interest and recommendation letters. These submissions then become the basis of your selection. A well-written essay and solid recommendation letters are enough to build your case for admission, as these are used to judge your personality traits and aptitude. Most of these B-schools do not even bother with your school scores. Statistics suggest that the number of aspirants appearing for both these exams showed a steady rise over a span of five years, before registering a slight dip in the years 2016 and 2017. This decrease notwithstanding, the number of candidates appearing for these two tests is still humongous. 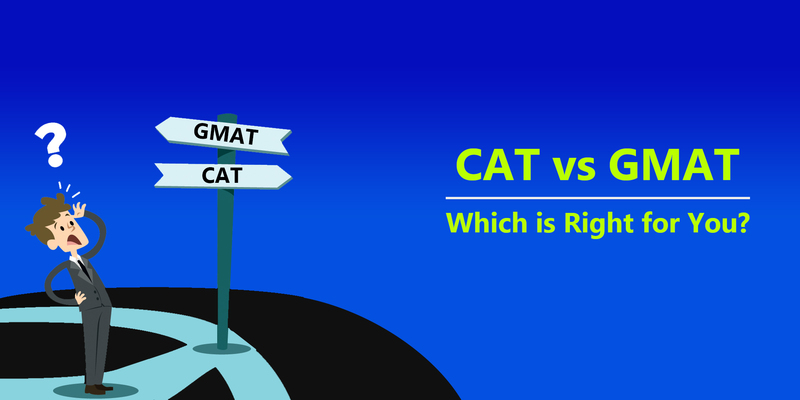 However, if one were to look at competition from a comparative viewpoint, CAT aspirants far outdo the number of those appearing for GMAT. Every year, an average of 60,000 candidates take the GMAT, whereas the figure rests at 1,70,000 for CAT. The competition is unbelievably high. If you are aiming for a seat in top five IIMs, you have to outdo nearly 1.7 lakh other candidates with similar aspirations and probably similar levels of preparation to bag one of those 1,000 seats. Those are some daunting odds. Simply put, an aspirant’s chances of cracking the CAT to make it to one of the top B-schools is between 0.5 and 1 percent, whereas the conversion ratio for GMAT is nearly 10 percent. This is not to say that GMAT is in anyway easier than CAT, but given the lower level of competition, it definitely offers you better odds. In case you miss hitting the bull’s eye with your CAT score, you have to wait an entire year before you have a shot at improving your score, since the exam is conducted only once every academic year. There is no such limitation for GMAT. On the contrary, the exam has a lifetime cap of eight attempts. It is upon an individual to decide at what frequency they’d like to use up those eight attempts. You can take the GMAT as many as five times in one academic year. Of course, each of these attempts comes with a reasonable pinch to your pocket, but if you are desperate to make the cut, GMAT gives you an excellent opportunity to improve your scores without wasting an entire year. On similar lines, the validity of your CAT score is one year. This means people taking the exam in 2018 will be able to use their score only for admissions to management programs in the year 2019. The GMAT score, on the other hand, is valid for five years. The one important factor where scales tip in favor of CAT is the cost of taking the exam and the ensuing expenses for pursuing a management degree. The registration fee for GMAT is $250 or roughly Rs 17,000. With five attempts in a year, you are looking at an expenditure of Rs 85,000 just for taking the exam. The registration fee for CAT is Rs 2,000. The average fee for B-school courses overseas in the range of Rs 20,00,000-65,00,000, whereas the average fee for B-schools in India is Rs 12,00,000. Of course, a degree from prestigious international B-school also makes you eligible for a fatter pay package, in the range of Rs 65,00,000 per annum, while the average salary for B-school graduates in India is around Rs 12,00,000 per annum. So yes, in the long run, the Return on Investment is higher for GMAT, but most people do not have the kind of capital to be able to afford such expensive education. While GMAT mandates a minimum work experience of 2 years, there is no such requirement for taking the CAT. If you are looking to pursue a masters degree in management straight out of college, CAT is your go-to option. Working professionals with some experience and savings to back them up can aim for GMAT.